Dambuster Cheddar is a full flavoured, pasteurised, strong Cheddar cheese produced in Market Rasen, Lincolnshire, in honour of the RAF 617 squadron based at local RAF base, Scampton. The mature cheddar is wrapped in a distinctive black wax, helping the cheese retain the soft, creamy texture whilst maintaining it’s classification as a firm cheese, and preventing further maturation upon leaving the dairy. 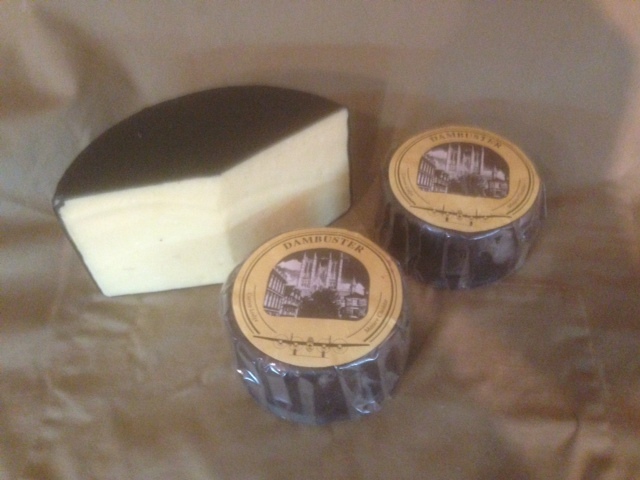 Dambuster Cheddar Cheese is a robust and full bodied, strong tasting Cheddar. It has a buttery note, and lasting creamy mature Cheddar flavour, full of bite and acidity. As Dambuster Cheese is such a strong tasting mature Cheddar, many people have said that coupling it with something that counters this, such as fruit chutney or Lincolnshire plum loaf results is an extremely tasty treat. Would also work well as part of a Ploughman’s lunch and with an equally full bodied red wine.